Enjoy the soothing, moisturizing properties of this specially formulated blend of Castor Oil, Almond Oil, Lanolin, Aloe Vera and Cocoa Butter. Gentle enough to use daily. Rinses clean and never leaves a soapy residue. 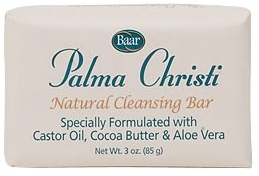 Long lasting and made from the purest ingredients, Palma Christi bar soap nourishes and hydrates, making it a great for all skin types. Pamper your skin with its rich, creamy lather for an all-natural clean, fresh feel. CayceCare™. Glycerin ~ helps produce a very mild soap which cleanses, softens, and moisturizes the skin. Glycerin, a humectant, is thought to pull moisture from the air and moisturize the skin throughout the day. Most commercially made detergent bars have had this naturally occurring glycerin removed, requiring the addition of chemicals to promote moisturizing capabilities. Castor Oil ~ contains a chemical composition of ricinoleic acid - this is unique to castor oil. Applied to the skin it acts as a natural emollient, penetrating the surface layer of the skin. Soap made with castor oil is very moisturizing and has a dense, viscous lather. Olive Oil ~ contains a high proportion of Vitamin E that fends off free radicals. It is absorbed quickly without leaving a greasy film behind. It is also known to be great on sensitive skin. Lanolin ~ has an unsurpassed moisturizing and emollient action on the skin. It reduces moisture loss, thereby restoring softness and elasticity, especially to dry or chapped skin. Cocoa Butter ~ is one of the most stable, highly concentrated natural fats known. Cocoa butter is often recommended for skin conditions such as eczema and dermatitis. When applied topically, it creates a barrier between sensitive skin and the environment and also helps retain moisture. In addition, it contains cocoa mass polyphenol (CMP), a substance that inhibits the production of the immuno globulin which is known to aggravate symptoms of dermatitis. Sweet Almond Oil ~ Great for all skin types as an acting emollient. It is best known for its ability to soften, soothe and recondition the skin. Aloe Vera Gel ~ contains numerous vitamins and minerals, enzymes, amino acids, natural sugars and agents which may be anti-microbial. The combination and balance of the plant's ingredients are what purportedly gives it its healing properties. Sodium Tallowate, Sodium Cocoate/Sodium Palm Kernelate, Water (Aqua), Glycerin, Titanium Dioxide (CI 77891) (No nano particles), Sodium Chloride, Ricinus Communis (Castor) Seed Oil, Olea Eurpaea (Olive) Fruit Oil, Lanolin, Theobroma Cacao (Cocoa) Seed Butter, Prunus Amygdalus Duleis (Sweet Almond) Fruit Oil, Aloe Barbadensis (Aloe Vera) Juice Leaf, Pentasodium Pentetate, Tetrasodium Etidronate, Tocopheryl Acetate.